Though I captured the image above during my second Artist-in-Residence with the park in October 2010, my visualizations for this image started almost a year earlier in November 2009 during my first residency. In the months leading up to my first visit, I read a wonderful book by Ann Rockefeller Roberts titled, “Mr. Rockefeller’s Roads: The Untold Stories of Acadia’s Carriage Roads.” Concerned the “new” automobile would threaten the natural beauty and affect the quiet, peacefulness Mount Desert Island provided him, his family, and fellow community members, John Rockefeller, Jr. envisioned setting aside land to establish a network of carriage roads limited to only carriage riders, drivers, and pedestrians could utilize for recreational purposes. By 1940, a 57-mile system of carefully designed and developed carriage roads existed for exactly that purpose. Inspired by this story, as I turned each page, I started to piece together the kind of photograph I wanted to make when I arrived and experienced the phenomenal carriage roads for myself. As soon as I made it to Acadia in November, I hit the carriage roads on foot or by bicycle, traveling almost every length of the 45-miles within the park boundaries. Occasionally, I stopped to make a photograph or two or ten or fifty. I felt I was capturing “nice,” technically acceptable photographs along the way but never truly felt I had captured something that did this unique feature within Acadia justice. Now once you have a spark of enthusiasm or even a semblance of an idea, don’t give up on it! I had the fortunate opportunity to return to Acadia in October 2010, so I had precisely 10 months to analyze what went wrong in the first attempt and design an approach that would yield the type of image I wanted to capture on the carriage roads. I wanted to share how much fun it was to hike and bike along these paths, so I decided I would show myself in motion. I’m not a fast walker, and so help me, I do not run ever (unless someone is chasing me or is giving away free cameras across the field…) so I planned to create the image while on a moving bike with a slower shutter speed to imply movement and speed. 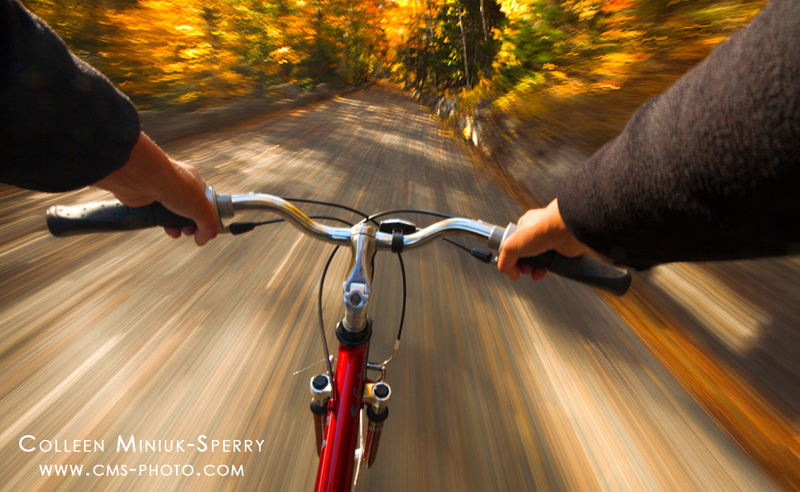 I could hold the camera in one hand up to my eye while keeping one hand on the handlebars to render an OK image, but that approach seemed doomed for certain disaster for clumsy ol’ me. I needed both hands on the handlebars, but how would I trigger the shutter? I mulled my idea over with my husband, who promptly suggested I research what skydivers do to trigger the shutter when they throw their crazy selves out of planes with both hands free. Hmmmm, yes…I found a company online, Conceptus, who made switches for just this reason! So I traveled to one of their distributors in Eloy, Arizona to pick up my tongue-switch, a cable-release that would plug into the camera and would allow me to trigger the shutter hands-free with my tongue! After just a few clicks, I knew this tool would certainly help me capture my vision! With fresh enthusiasm for my idea, I returned to Acadia and started biking the autumn-kissed, tree-lined carriage roads with my camera strapped to my mid-section with a basic strap, my camera manually focused at infinity, my lens set at 16mm for a wide-angle perspective, and of course, my tongue switch in my mouth! I’d bike as fast as I could downhill, experimenting with various shutter speeds to render just enough motion but not so much it looked like the stars when the Millennium Falcon went into hyperspace mode. Six-hundred shots later- only four of which turned out to my liking – and I can confidentially say this photograph, “Ride With Me” is exactly how I felt about enjoying the carriage roads and perhaps more importantly, it conveys exactly what I wanted to share with my viewers about that special feeling. 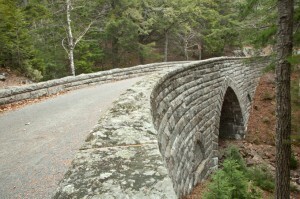 I hope this photograph does inspire you to go to Acadia and see the carriage roads yourself! Truly, as the title expresses, I wanted you to ride with me. Whether you’re photographing from a bike, an airplane, or with your two feet solidly planted on the ground, remember to look at your image on the back of your LCD before you move yourself or your tripod to be sure what you’ve captured is exactly what you envisioned and wish to share with your audience. If you don’t, you’re cheating yourself and your audience out of something very important you have to say about the scene in front of you. Work the scene by moving your position, changing lens, using light differently, modifying your exposure settings, applying filters, or whatever else you can do to ensure you capture that vision. And like I suggested earlier, once you have an idea pop into your head or you see something in the field that excites you, don’t walk away or give up until you’ve recorded it with your pixels! Technical info: Canon 5DMII, 16-35mm at 16mm, ISO 50, f/20 @ 1/5th of a second, polarizer, triggered by Conceptus tongue-switch, basic post-processing. Making the Image: "The RCMP Musical Ride" Introducing the NAU Photography Students “Behind the Image: Guest Blogger” Project!